The industry has suffered over the past couple of decades & seems to be in a slow decline all over the world. I have been in the piano industry in one form or another since the 1970’s. At that time, the main threat to the piano was the electric organ, or so we all thought. This never eventuated simply because the technology was nowhere near good enough for the organ to take the pianos place. That was, until the digital keyboard started to sound more & more like a piano!! Please don’t get me wrong. Electric pianos do have their place. I have & use fairly regularly 2 electric pianos; a Technics P 30 & a Kawai MP7, both of which have great piano sounds. I also run an Oxygen 88 keyboard hooked up to my Imac running Logic 9 so I can record. I also have an older Ensoniq KS 32 synth. Let me just reiterate; “electric pianos do have their place! !” BUT, electric pianos have NO place in the lounge room set up as the main instrument that’s used in place of an acoustic piano! Piano teachers complain about students who own electric pianos because their technique is totally different from that of a piano player. In other words, their technique is not good & playing on the teacher’s piano at lesson becomes a serious problem requiring most of the lesson to adapt. The sales spin by electric piano retailers is that they will never need tuning. This could be the case, but, they WILL break down & in general, repairs will cost dearly. Keyboard retail outlets sell electric pianos on their ‘gimmick’ factor, stating that the ‘feel’ or touch is exactly the same as a ‘real’ piano. Please don’t be fooled by this sales banter as this is false advertising. 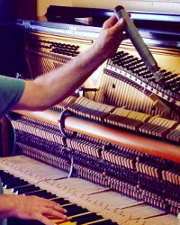 The acoustic piano’s action works mechanically with thousands of parts creating friction & weight from the moment a finger presses a key & the note sounds. The piano is a mechanical masterpiece of ingenuity. It’s the mechanics of the piano that helps produce the necessary technique & muscle memory development. Piano teachers have told me that they know within seconds if a new student has an electric piano at home just because of the way their fingers caress the keys. There is very little effort needed to play an electric piano. The opposite is true for an acoustic piano. The ‘graded hammer action’ that you may have heard about on electric pianos is spin & can never take the place of a real piano action. The sound from an acoustic piano is what an acoustician would call ‘first air.’ The electric piano’s sound is recorded so the tone of the electric, no matter how many bells & whistles, how much it cost or what sales pitch you’ve heard will never come close to a real piano. If the student of the house is a child then it’s terribly important that they have an acoustic piano to practice & learn on for the above reasons. Be warned that the student will have trouble adapting to anything other than an electric piano if you should decide to take this route. Electric pianos are threatening to ruin the acoustic piano industry & piano tuner / technicians are saying the same thing the world over. It is truly abominable that, yet again, the digital age is threatening to engulf another icon; one of the most amazing, musical inventions – the acoustic piano!! Do not be a part of this revolution! The price you will pay for the convenience may cause irreparable damage to the student’s technique & self confidence.